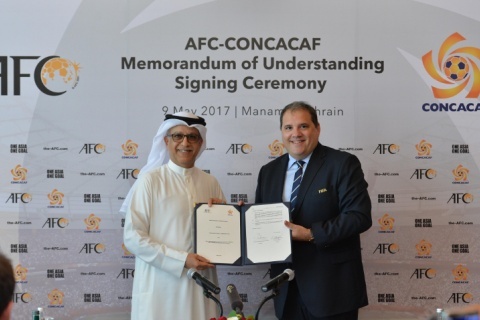 The ceremony was conducted by the respective confederation presidents Shaikh Salman bin Ebrahim Al Khalifa and CONCACAF President Victor Montagliani, the second such signing in two years, and attended by delegations from the AFC Executive Committee and the CONCACAF Council. “The AFC is a firm believer in strengthening our partnerships with our sister Confederations. Today we further enhance the strong bonds that exist with our friends at CONCACAF”, said Shaikh Salman. Montagliani said the MoU “represents an important step forward in achieving our ONE CONCACAF Vision as we continue our efforts to advance the game. Through the MoU, the AFC and CONCACAF will focus on joint efforts to explore the possibility of competitions opportunities between the two Confederations. It will also pave the way for technical and administrative training exchanges in several areas including good governance, management, development, competitions, refereeing, marketing and communications, sports integrity, technology, and social responsibility.